What’s New with PARCC and K-12 Testing in Arkansas? As you know by now, this year, Arkansas has a new testing system for students in grades 3 – 11: Partnership for Assessment of Readiness for College and Careers (PARCC). Last March, we released a blog post taking an in-depth look at PARCC, highlighting some of the unique features of the test. Since then, many details have been revealed by the Arkansas Department of Education (ADE) regarding testing this year; therefore, in this blog post, we will provide you with these updates by answering some FAQs! What assessments will students take this year? Recently, the ADE submitted amendments to its ESEA Flexibility waiver to make changes to the state’s PARCC testing – if the amendments are accepted, PARCC Algebra II and PARCC Grade 11 ELA/literacy will be optional assessments that districts can choose to administer. If a district chooses to administer these exams, the ADE will cover the costs. If a district opts not to administer the Algebra II assessment, the ADE states that the district must provide students with the opportunity to take one the following assessments at no cost to the student: ACT, COMPASS, ASSET, PSAT, or SAT. Also, if the amendments are accepted, students taking Algebra I or Geometry in grades 7 or 8 will not be required to take the Grade 7 or 8 PARCC assessment and the Algebra/Geometry test; they would only have to take the Algebra I or Geometry test. How will PARCC be administered? PARCC will be administered online, unless a district has opted to administer the assessment by paper/pencil. For districts administering the assessment online, PARCC has released guidelines for technology usage to help districts prepare for the online test. Districts that opt to use the paper/pencil version had to submit an Assessment Hardship Waiver to the ADE by early August this year. Districts applying to opt into the paper/pencil version had to identify a reason why they could not administer the test online (insufficient bandwidth, insufficient device capacity, internal infrastructure, or other), and these districts had to submit a plan for how to address the deficiency, so PARCC could be administered online in future years. With all the broadband issues that have been discussed this year, we predict a number of districts have opted for the paper/pencil version, but the ADE has not released the list of districts yet. Additionally, some high schools will be administering the PARCC this fall to block courses in grade 9-10 ELA/literacy and Algebra I and Geometry. The Benchmark exams will be administered to grades 5 & 7 in science April 14-15, and the End-of-Course Biology exam will be administered April 28-29. 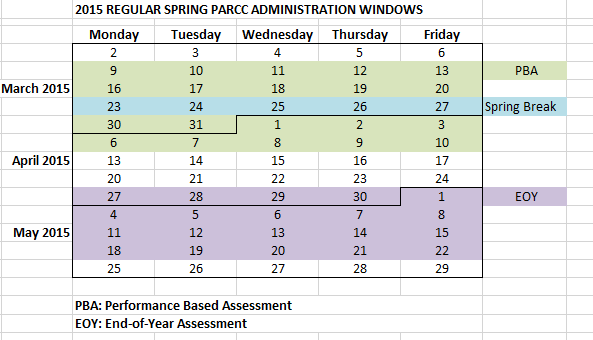 Districts will decide at what point during the windows to administer the specific PARCC assessments. We predict that most districts will need to administer the assessments to different grade levels throughout the time block, as many districts will not have the capacity to administer the assessment to all students in a school on the same day. In that case, the ADE and PARCC will dictate the order of assessments. We think that it is important to point out that the end-of-year assessment will be administered later this year than the previous Benchmark and End-of-Course exams. We predict this may result in the weeks in May looking much different in many schools than in the past when May was “post-testing” time. PARCC has released two online learning modules for educators. The ADE highlighted the learning modules in a Commissioners’ Memo here. PARCC has also released practice tests for the performance based assessments in ELA/literacy and math. The practice tests are simulations of the online assessments, so you can take the assessments just as students will do this spring! Furthermore, PARCC has released sample test questions in ELA/literacy and math. Read more about the sample questions and their features in our previous blog post. As PARCC and the ADE release more information about PARCC and K-12 testing this year, we will keep you posted! As the testing in the state is undergoing these big changes this year, we believe it is important for all to be informed!